One of my absolute favorite days of the year is Luck Reunion. Full stop. Not just of South by Southwest, but of the whole freakin’ year. It’s a full-day festival on Willie Nelson’s little Texas town called Luck, and it’s full of just great music, delicious food, and about the nicest people on this green earth. This year, though, I got asked if I’d like to try Willie’s newest product: Willie’s Remedy. Now, if you don’t already know, Willie has his own brand of weed—because, of course he does—that he grows out in Colorado and sells legally. I’ve never tried Willie’s Reserve, so do with that information what you will. 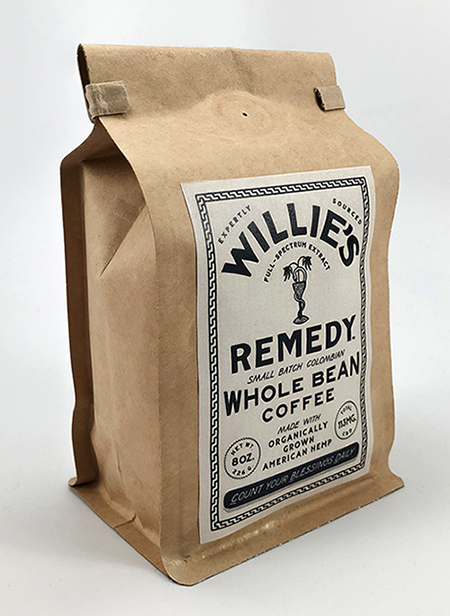 Last month it was announced that the Red Headed Stranger had created his own line of coffee infused with hemp extract, and a lucky few of us got to try it during Luck Reunion (oh, and listen to a sneak peek of Willie’s upcoming album, which you know is great, y’all!). I’m not a coffee snob by any means, but I’m a teeny tiny bit picky. I don’t love very acidic coffee, and I normally have to sweeten and dilute mine with some milk and sugar. We sipped Willie’s Remedy both hot and cold, and I have to say that I was super impressed. It wasn’t bitter or acidic at all, and it was SO incredibly smooth. I drank it black, which I NEVER do. Because of the hemp in the coffee (each 8 oz. cup contains 7 mg. of hemp-derived CDB), it’s alleged that it reduces the jitters people sometimes get from caffeine, giving you a balanced lift instead of an insane buzz. It was so delicious that I went to go buy it from the website—which is the only place you can pick it up, for now—but I had a total sticker shock at its price. For 1/2 pound of beans it’s $36, so it definitely ain’t cheap. For those curious, though, trust me, you’ll be pleasantly surprised! BTW: It’s said that Willie and his wife Annie hope to release some more topical products down the line, so stay tuned.